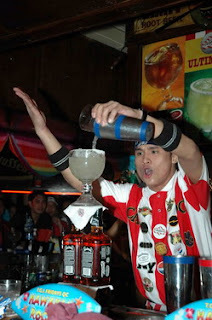 The "World's Greatest Bartender" has been crowned! Frederic (Eric) V. Martinez, a bartender in Makati City, Philippines has triumphed over "eight of the best mixologist from around the globe" to take the title for a year. Eric wins 10,000 USD and bragging rights for a year. I'm not sure what drink Eric is making in this photo, but it seems to be quite an achievement from the looks of things. Eric's favorite drink is beer, and he likes to make Bahama Mama's. All the details can be found in the press release here. Videos and photos can be seen here.